GRO J1655-40 and GRS 1915+105 are superluminal jet sources ("microquasars") with compact objects that are postulated to be black holes spinning near the extreme theoretical limit. As such, they are excellent candidates to observe the theoretically predicted general relativistic effect of dragging of inertial reference frames around spinning black holes. Frame dragging should cause the accretion disk to precess if it does not coalign with the BH equatorial plane: thus it may produce direct observable effects. Fig. 1: By carefully modeling the soft disk component in the observed X-ray spectrum for high-luminosity states, it was found that the inner edge of the accretion disk is at ~2*(GM/c^2), which is much closer to the black hole than the last stable orbit (6GM/c^2) for non-rotating black holes. It is therefore concluded that the black hole in this system must spin at about 93% maximal rotation. With both the black hole spin and mass (about 7 solar masses) known, the expected (from theory) precession frequency of the inner portion of the accretion disk (where most soft X-rays come from) was calculated due to frame dragging. The result is ~300 Hz, which is precisely the observed frequency at which X-ray brightness varies nearly periodically. 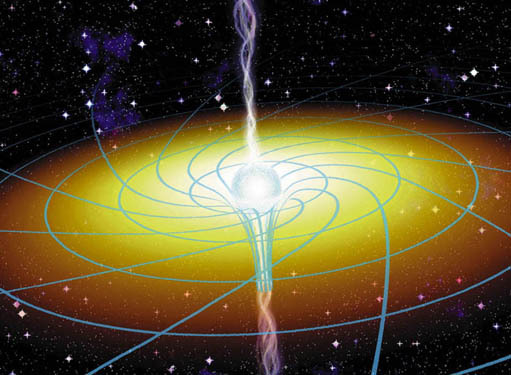 The same analysis has been applied to several other black holes (including GRS 1915+105). Good agreement between the theory and observations is seen in general. Figures and captions courtesy of Wei Cui. This page is maintained by the RXTE GOF and was last modified on Wednesday, 27-Jun-2001 11:59:06 EDT.